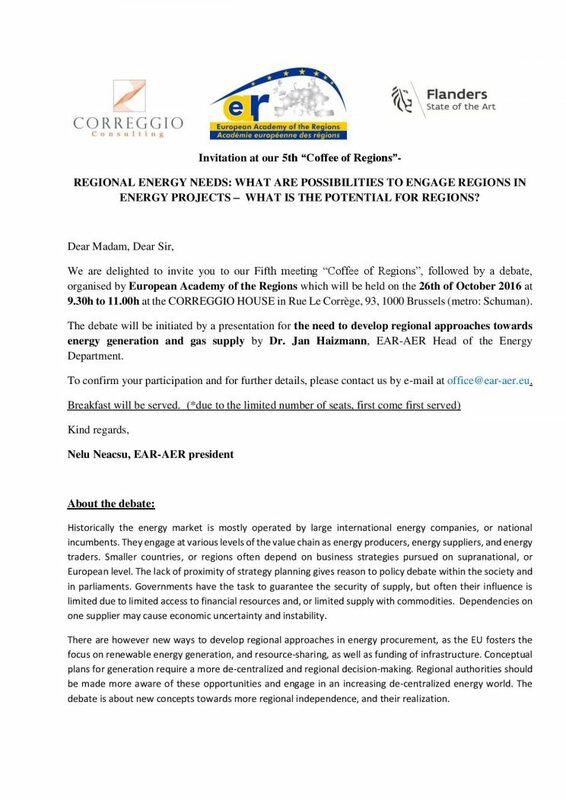 Invitation at our 5th “Coffee of Regions”- REGIONAL ENERGY NEEDS: WHAT ARE POSSIBILITIES TO ENGAGE REGIONS IN ENERGY PROJECTS – WHAT IS THE POTENTIAL FOR REGIONS? We are delighted to invite you to our Fifth meeting “Coffee of Regions”, followed by a debate, organised by European Academy of the Regions which will be held on the 26th of October 2016 at 9.30h to 11.00h at the CORREGGIO HOUSE in Rue Le Corrège, 93, 1000 Brussels (metro: Schuman). The debate will be initiated by a presentation for the need to develop regional approaches towards energy generation and gas supply by Dr. Jan Haizmann, EAR-AER Head of the Energy Department. Historically the energy market is mostly operated by large international energy companies, or national incumbents. They engage at various levels of the value chain as energy producers, energy suppliers, and energy traders. Smaller countries, or regions often depend on business strategies pursued on supranational, or European level. The lack of proximity of strategy planning gives reason to policy debate within the society and in parliaments. Governments have the task to guarantee the security of supply, but often their influence is limited due to limited access to financial resources and, or limited supply with commodities. Dependencies on one supplier may cause economic uncertainty and instability. There are however new ways to develop regional approaches in energy procurement, as the EU fosters the focus on renewable energy generation, and resource-sharing, as well as funding of infrastructure. Conceptual plans for generation require a more de-centralized and regional decision-making. Regional authorities should be made more aware of these opportunities and engage in an increasing de-centralized energy world. The debate is about new concepts towards more regional independence, and their realization.